Sub:- Mid Day Meal Programme - Implementation of Automated Reporting System by means of SMS - Certain Instructions - issued. The attention of all the District Educational Officers/ Mandal Educational Officers in the State is invited to the reference cited. Inspite of repeated instructions during Video Conference the MDM daily report by way of SMS is not improved and Headmasters are not taking this task seriously. Further, they are informed that the Government of India and State Government are very particular on this issue. The Budget allotment and rice allocation will be made based on the report submitted by the Headmasters by way of SMS. Therefore, while enclosing the status report, all the DEOs and MEOs in the State are hereby instructed to see that all the Headmasters should send daily report of MDM taken by way of SMS through their registered mobile numbers. If any gaps noticed in this regard the concerned Headmaster/ MEO will be held responsible. Note:The status of registered mobile numbers is available in the website "mdmhp .. nic.in" . 1. All the Mandal Educational Officers and Head Masters whose mobiles numbers have already been activated shall send SMS to Toll Free No. 15544 as MDM <Space> A. 2. After receiving activation massage the Head Masters have to send the MDM taken students number by SMS to 15544 as MDM <Space> No. of Students Taken Mid Day Meal. Example: if 10 students are taken meal send the SMS as MDM 10. 3. This data should be sent every day. 4. 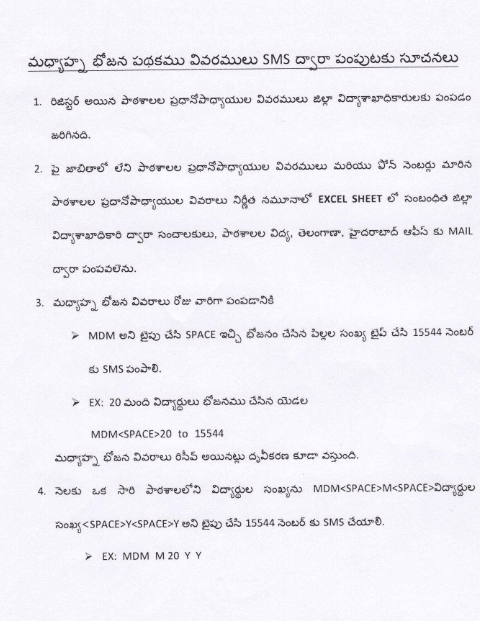 In case of change in mobile numbers, the same has to be brought to the notice of Sri N.Sridhar, DPO, 0/o DSE office, Mobile No. 9618403032. 5. All the District Educational Officers are instructed to send the mobile numbers of the HMs which are not included in the list in the prescribed proforma to Email ID: dpo-cdse@telangana.gov.in & mdm_ts@yahoo.com. Top priority should be given to this item of work and any deviation shall be viewed seriously. Step 2: MDM <Space> No, of Students ➤ for No. of Students Taken Mid Day Meal. Mid-Day Meal taken report by SMM is meant for effective monitoring of daily and monthly mid-day meal data through SMS to be sent by the schools. 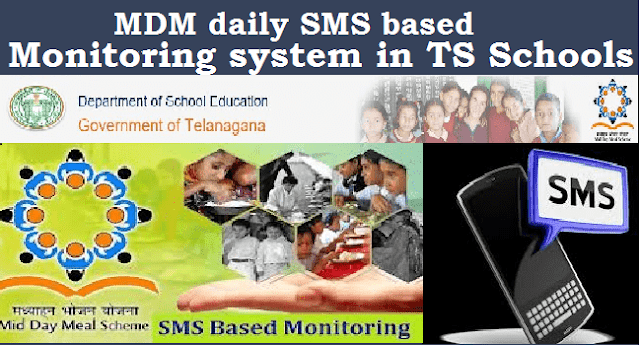 The MDM Monitoring through SMS provides additional data communicating mechanism for the MDM in-charge/teacher who has to send the daily/monthly data using SMS. MDM Monitoring through SMS, once activated on mobile device, does not need Internet to send MDM figures as user has option to send the figure through SMS from the Mobile. MDM Mobile app: This simplifies the job of MDM in-charge, who even does not have to remember the SMS formats. The higher authorities at Block, District and State level have a very simple and effective mechanism in shape of this app on their mobile devices for effective and efficient monitoring of daily as well as monthly data transmission by all the MDM in-charge falling under their jurisdiction. The authorities can send SMS alerts to all defaulters using single button available in the app. Provision of Egg/Banana, The State Government is providing Rs.1.00 per day per child to provide weekly 3 eggs / banana to all children. Telangana State is providing super fine quality rice. The T State Government is providing MDM to IX and X class students also from State’s own resources. Creation of monitoring cell for regular review of scheme. Data has been entered into MIS portal regularly and 100% completed. The same is completed for 88% schools. Services of SSA data entry operators at District/Block level are being utilized for updating the data in the MDM MIS web portal.